It turns out that it has been a month since I worked on the Cocoa Leaf Medallion quilt. A bit of open honesty here: I am struggling with motivation to work on this quilt. I am not in love with it, but I don’t loathe it as a project. I am trading the quilt for time with a therapist, and I seem to be able to work to just keep pace and keep the balance even. I decided that last week my goal was to get the top finished and the backing assembled. So with that in mind I accepted a mini quilt swap with a friend and spent a week making the mini quilt. Yup, true story. 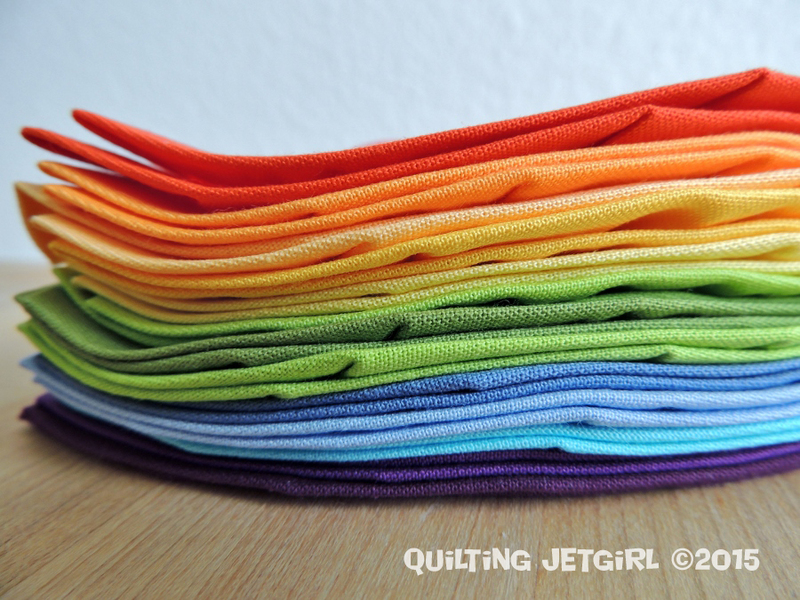 …and the stack of rainbow goodness is also a treat. Top to Bottom: Kona Flame, Kona School Bus, Kona Cheddar, Kona Corn Yellow, Kona Buttercup, Kona Chartreuse, Kona Peridot, Kona Chartreuse, Kona Delft, Kona Cornflower, Kona Bahama Blue, Kona Dark Violet, Kona Eggplant. 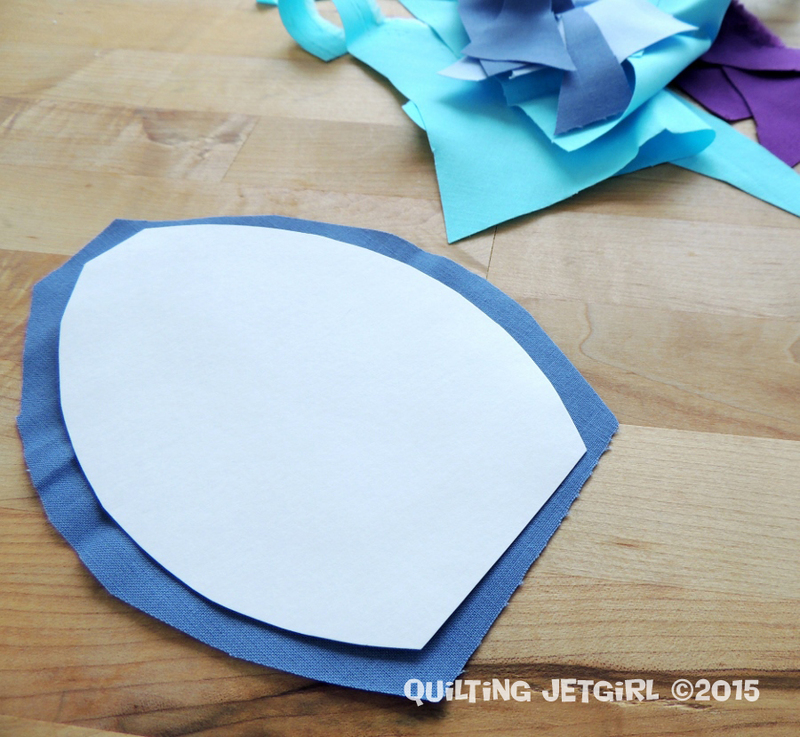 Linking up to Let’s Bee Social and WiP Wednesday (buttons to the right). Those colors are so pretty! 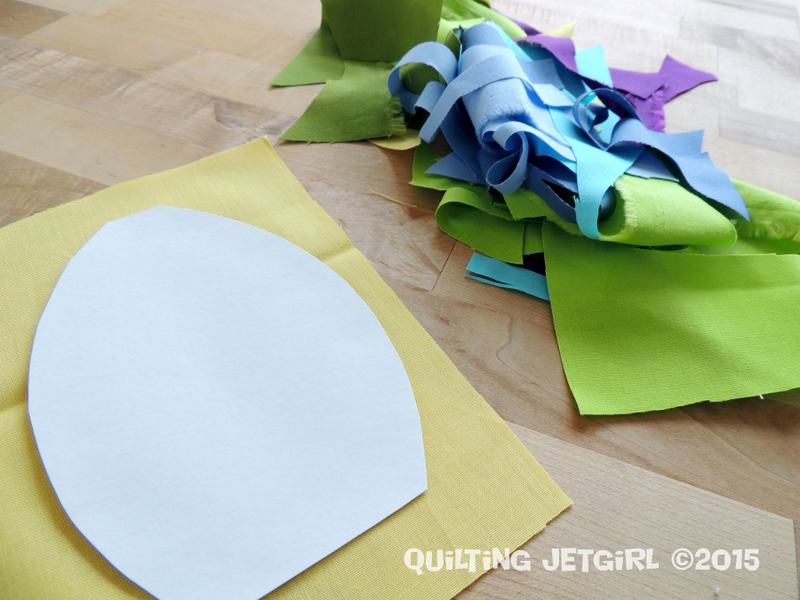 It looks like you’ve got all the applique shapes prepped and ready to go, so good luck moving on to the next step while you’re still motivated. It’s a cool design and it’ll be a gorgeous quilt when you get it finished. Staying motivated on a given project is always what trips me up. If you can do it, so can I – I’m going to try and get my backing put together for my string quilt. The thing that’s stalling me out is the friggin’ label. Since it’s a bee quilt, I want to list everyone and I’m trying to figure out how I can do that in a cohesive manner. Time to take pen to paper, I guess. Love the pretty rainbow of petals, btw. That’s definitely gratifying. Oooooh that is a pretty stack of leaves! Sometimes overcoming the procrastination is that hardest part. Mmmmm, those projects are tough, aren’t they? The ones for which you just lose your spark… I hope that by diving back in and getting your gorgeous (I’m drooling) stack of rainbow goodness ready, you are renewed and ready to finish it up! It sounds like you have a good plan so far! Just ignore the squirrels LOL!! I was seriously almost rolling around laughing at that one. Okay, not really rolling around… but definitely laughing out loud! 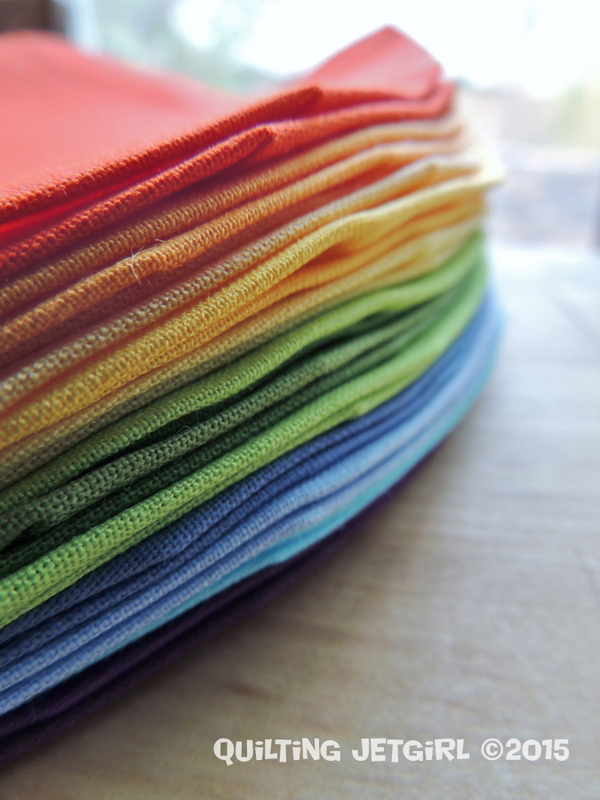 I am excited to see the stack of applique rainbow goodness. I agree that it is hard to continue a project when you don’t feel like it. It looks like you are making good progress though. Those Kona fabrics in extreme close up look even more wonderful. Yvonne, I look forward to seeing what you do with these appliques. Best wishes in both your quilt therapy and regular therapy. Oooh… such a lovely pile of Konas. Thank you for naming them for me… we all know I’d be trying to match the screen with my colour card otherwise! 🙂 Normally I’d say that if you’re not motivated to work on a quilt, you should walk away, but where this one’s part of a deal… well, you don’t so much have that option. Good for you for slugging your way through! Yep! SQUIRREL! is absolutely appropriate. You are a riot. Happy sewing! I sometimes have a hard time moving on to the next step. Right now I am procrastinating adding borders to a quilt. Then I can show pictures of the top. But I love that at least you have productive procrastination. I usually end up not getting anything done. Love your rainbow pile of leaves. It is sometimes difficult for me to maintain excitement on a “have to” project (OSU quilt, anyone? ), but you are making good progress. Those colors are so good and your design is terrific. Hang in there! I love those colours – they would make me feel better for the time put in on the project. I know what you mean about not wanting to get to it but sometimes when I have a must finish project, i clear the decks and put away everything but that project and review where I am and usually I get back into it again! It looks like you made lots of progress, so hopefully that will get you motivated again, head down, to the finish line! Love your honesty in this post, as I think we all struggle at times to get on with a project. So many pretty things out there! haha. I hope all is well in your neck of the woods and I know you are farther along now… I am just catching up on reading. I really am excited to see this finished though, it’s going to be beautiful!